Spend your vacation in Puerto Rico and stay at one of the island's best kept secrets. This ocean front condo is just feet from the ocean and includes stunning panoramic views of the bay. Wake daily to the sights and sounds of the surf. Both bedrooms have views of the El Yunque rain forest, air conditioners, a window to enjoy the ocean breeze, and great closet space. The condo is centrally located to many popular destinations. Walk to the kioskos and eat at one of the many restaurants. All five of Luquillo’s famous beaches are within a short drive from the condo. Surf or paddle board at Luquillo’s world famous La Pared Beach. The Apartment is minutes away from the El Yunque rain forest, horseback riding and a casino. It is also 45 minutes from the Ceiba Ferry to Vieques and Culebras Islands. It is 40 Minutes from the airport and 50 Minutes to Condado and Old San Juan. Apartment 301 located at Calle 1, Fortuna, is a third floor walk up. It is a 800 square foot, 2 bed, 2 bath condo which sits on Fortuna beach and has breath taking ocean views from the great room. The living room boasts a flat screen TV, contemporary sleeper sofa, and chair. Cable and wireless internet are also provided. The kitchen is equipped with microwave, refrigerator, toaster oven, blender, and range top. It is equipped to to make and serve home cooked meals while on vacation so you can eat healthy and save money! This part of the island has recovered from Maria and all of the services to the condo have been restored for months now. However, the part of the wall to the ocean with the stairs to the beach was damaged during the storm so here is no direct beach access right now. There is also still minor cosmetic damage to the exterior to of the condo and many other buildings in the area. Apartment 301 is the ideal condo for couples or families of up to 6 people for sleeping. Located right on the ocean in a quiet, family oriented neighborhood, this condo will have you wondering what your life would be like if you moved down to Puerto Rico. It is a slice of paradise and it is yours for booking. From the Tommy Bahama sheets to the towels and the sofa, this immaculate beachfront condo is better than any hotel room on the island. Offers one off street parking space in a private and gated section for residents only. There is a supermarket located just minutes away from the condo. There is also a Walgreens, Kentucky Fried Chicken, Taco Bell, Wendys, and McDonald's in the same plaza. The nearest Walmart is just 15 minutes away. The view is simply amazing and we were sold the moment we walked through the front door and saw that the beach and the ocean were less than 50 feet away. The condo is located in an authentic Puerto Rican family oriented neighborhood. The balcony runs the full width of Condo 301. The great room features a full width wall of windows that overlooks the balcony/ocean. This wall folds completely away, exposing the entire great room to the ocean. Or just swing on the hammock on the balcony and just relax to the sites and the sounds of the ocean. All beaches in Puerto Rico are public and you can walk from Playa Fortuna along miles of beach front. Condo 301 is located just 35 miles to the east of San Juan and is accessed primarily well marked signs. 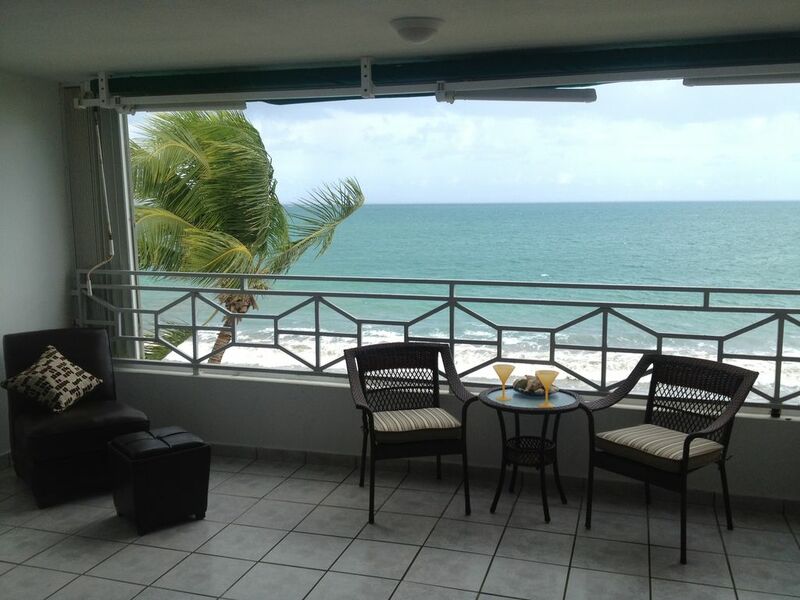 Condo 301 is located in an authentic Puerto Rican community. You may wake to the local fisherman fishing in the bay in morning on Playa Fortuna or people horseback riding on the streets or beach. The Luquillo Balenero, or public beach, is a mile away and features inexpensive parking, bathrooms, a swim shop, several restaurants that also serve alcohol. The famous Luquillo Kioskos, or kiosks, include over fifty restaurants and shops and are also a mile away. The La Pared surf beach is located in downtown Luquillo two miles away and also includes access to restaurants, bars and a surf shop. Our favorite restaurant in Puerto Rico is the Brass Cactus TexMex bar and Grill and is also located a mile and a half away. The El Yunque Rainforest National Park is less than 15 minutes away. The ferry to Culebra and Vieques Islands is just 45 minutes away in Ceiba. Both island feature excellent beaches, shops, bars and restaurants. Each island is worth visiting on a day trip but the Flamenco Balenaro, or public beach, on Cuelebra is a "must see." It is ranked as one of the prettiest beaches in the world. We are a 10 minute drive from El Yunque Rainforest. You can hear and smell the ocean from the bedrooms. We are 3 floors up and just feet away from the ocean. Incredibly serene! There are many farms and ranches in the Rainforest. You will see many along the main road. You will also see wild chickens and many people riding horses. We are located on the populated, East Coast. Rainforest and beach Communities as well as many resorts,hotels, casinos, and tour companies. Apartment 301 overlooks Fortuna Beach and has breathtaking views of the bay. Views of El Yunque mountain can be seen from the bedrooms. For Rent in several locations. Several Courts in the area. Lessons available. Several Courses in the area. Lessons available. Includes an English speaking property manager available to answer any questions you may have about the island or the property. We had a great time. Sad to leave. Definitely be back!!! The condo was well supplied with everything you needed for a comfortable stay. The property manager was very helpful and kind. We were very close to El Yunque and really enjoyed our time there. This was a good location, close to Luquillo beach and the Kiosks, El Yunque rain forest, Fajardo, Las Croabas, Humacao, and 25 min from the airport in San Juan. Alana was a great resource and left plenty of material in the apartment for one to experience the island. From Playa Fortuna one could quickly get to Rt-3. This area will be my place to go in the future. We enjoyed the sound of the waves. We had a relaxed time and enjoyed every bit of the time in the area. This is a GREAT place to stay. It's the perfect condo for a family with kids with little amenities like boogie boards and board games in the closet! Gorgeous view from the balcony and the doors open right up so you can enjoy the breeze. It's not right in luquillo on the main beach but a short walk down the beach or a quick drive and this is actually good because it's quiet! Thanks Alana for your accommodating our late checkin and Late check out. We hope to be back soon! We are happy that you enjoyed the condo and area. Please let us know when you will be returning to the island. The hammock on the balcony was awesome. It was nice to have boogie boards and chairs to take to the beach. Just as advertised, very clean, comfortable and close to all types of food. Family of five loved it. A storm has washed the beach wall away so access to the beach directly below is tricky. We found plenty of other beaches snorkel, swim and body surf on. Rain forest and waterfalls are only a few minutes away. Alana was great to work with. If you want to take the ferry to Vieques or Culebra ask her to get tickets in advance for you. We would definitely rent here again. We are happy that you enjoyed our condo. Thank you for the kind words. Please let us know when you would like to return the condo and island. This condo is AWESOME SAUCE!!!!! The view WOW! to die for!! We had some issues with keys but Alana made sure it was taken care of even went to the office and came back with the beach key. The first night we left the French doors open and to the sounds of the ocean awesomeness .The condo has everything you need. Towels, bedding, dishes, boogie boards...etc. which spent two and a half hours using in an warm water NICE!. So if your thinking of renting this unit just bring your clothes! There's a washer & dryer in the unit even! The neighborhood is very quiet & the building is very secure. I cannot wait to go back to Puerto Rico either December or January we will be here.. :-) Thank you, Alana! Oh yes by the way the jet skis you see in the backyard your Oceanview you could rent those from the beach down the road. I recommend them, polite and friendly. Thank you so much for taking the time to write such a great review. My wife and I are very pleased that you had such a great experience in our home away from home. Alana is just awesome and I'm glad to see she resolved the key issue quickly. We agree that boogie boarding in the bay is outstanding and the sound of the ocean at night just can't be beat. Thank you for choosing our condo to stay at and we hope to see you again in December or January. Let us know if there is any way we can assist you in the future. By the way, good to know about the jet ski rental. Down at the Kioskos you can also rent kyaks and paddle boats. This area of the island is very authentic. You will see many people riding horses to local restaurants. However, this area is also the home to many elite communities as well as tourism. Located on 5000 acres of beach, Across the street from the Rain forest, 20 minutes from the Bio Luminescent Bay, 15 Minutes from the Marinas, 40 Minutes from the airport, 50 Minutes to Condado and Old San Juan.